KANSAS CITY, Kan. — During one of Archbishop Joseph F. Naumann’s infrequent trips to Rome in June 2009, he visited the Three Fountains — the traditional martyrdom site of St. Paul. During the hot ride back on the Roman metro, one of his hosts asked him an important question. “What would you like [the Apostles of the Interior Life] to do for our archdiocese and for you?” asked Sister Susan Pieper, AVI. “I want you Apostles to come up with a program that will form my people to do what you Apostles of the Interior Life do,” he said without hesitation. It was the birth of what became the Catholic Spiritual Mentorship Program. 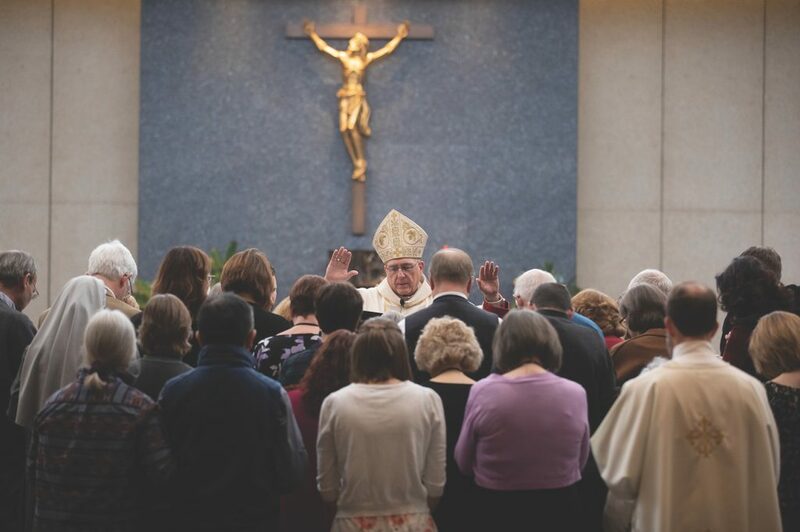 Since the first cohort (or group) was certified in 2013, 248 people have completed the program the Apostles, in conjunction with the archdiocesan- based Holy Family School of Faith, designed for use in the archdiocese. The most recent group of 72 received their certificates from Archbishop Naumann on Jan. 13 at a Mass at Savior Pastoral Center in Kansas City, Kansas. Six more will graduate in May. The program runs over the course of two years, during which the students study from course materials, online lectures and attend four residential weeks. The courses include basic theology, spiritual formation, discernment, morality, prayer and practical application. Once they are certified through the Holy Family School of Faith, the new mentors — all volunteers — are available to minister in their parish communities. The only prerequisites are that the students be Catholic and have received the sacrament of confirmation. A wide variety of people have become mentors. And nobody feels the instructors are speaking over their heads — or under, said Sister Susan. The students of this cohort had many reasons for wanting to become spiritual mentors. Robin Snyder, a member of St. Michael the Archangel Parish in Leawood, decided to go through the program with his wife Magda. Some people who’ve graduated have returned to help run the residential weekends. “The need is tremendous for people to walk with others,” said Russ Engel, a member of the Church of the Ascension in Overland Park who went through the program two years ago. Katie Locus, consultant to the archdiocesan office of deaf ministry and a member of St. Paul Parish in Olathe, undertook the program because there are not enough spiritual mentors for the deaf. Despite some apprehension, Locus has found everyone very welcoming and the program top-notch. Even though they graduated in 2017, returning spiritual mentors Vicki and Dave Prather, from St. Joseph Parish in Shawnee, found there is always more to learn. But the schedule is demanding. The challenge for new spiritual mentor Marilyn Baker, a member of Our Lady & St. Rose Parish in Kansas City, Kansas, was to learn a new dimension of prayer. Discernment, too, took some getting used to. Demand for spiritual mentors has always outstripped supply. Fortunately, the program is taking applications for a new class that will begin on May 18. Sister Susan urges those who want to apply to do so quickly, because the program usually fills up rapidly. For information, you may contact the program director Cari Hillyer at (913) 310-0014, ext. 10, or by email at: spiritualmentorship@schooloffaith. com. Joe, this is a great article. I graduated from this program two years ago. You have captured the many aspects of grace that come with being a student. Dave’s comment, “It changes your heart and your own approach to life” is spot on.